For the fourth year running (here’s 2013’s wrap-up, 2014’s wrap-up, and 2015’s wrap-up), we’re going to keep an eye on “local” draft prospects leading up to the 2016 amateur draft. By “local” I essentially mean anyone who hails from the DC/MD/VA areas plus anyone who is playing their college ball in the DC/MD/VA area. Because of the amount of text on the prep players I have this year, i’ve split the post up into Prep and college players. This post is months in the making, starting in May of 2015 when the various all-Area teams are announced and underclassmen are listed. The players are more or less listed in the rough order of their likely drafting: there’s 3-4 significant draft names to keep an eye one in particular (Rizzo, Lee, Agnos and Hess). Read on. Here’s a list of DC/MD/VA Local Prep players who will be rising Seniors in 2016 worth mentioning. I’ve tried to organize these players in the order of their significance as a prospect, which (fairly or not) i’ve driven mostly from their participation in tourneys and showcases. 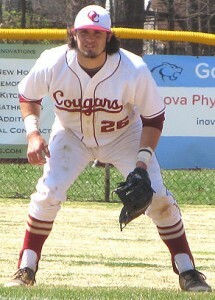 Joe Rizzo, INF for Oakton HS. Evoshield Canes Main Roster, early commit to South Carolina. 2015 All-Met, 6-A North Region player of the year as a junior. VHSL All Virginia 6-A player of the year. Hit an astounding .606 for Oakton as a junior. At PG National. Invited to the PG All-American game. At WWBA 2015 with Evoshield. Written up by Jonathan Mayo/mlb.com after his East Coast Pro game performance. At Area Code games. Rizzo looking like one of the better DC-area draft prospects we’ve had in years. D1baseball top 100 hs draft prospects. Khalil Lee, LHP/OF for Paul VI Flint Hill (via Centreville). VISAA Division I all-state in 2015, early commit to Liberty. 2015 summer team: Richmond Braves. At PG National. Invited to the PG All-American game. At East Coast Pro 2015. Also mentioned in Mayo’s piece post after East Coast Pro. At Area Code games. At WWBA 2015 with Evoshield. D1baseball top 100 hs draft prospects. Jake Agnos, LHP from Battlefield HS. 2nd team All-Met 2015. All Virginia 6-A in 2015. Famous for his 21-K playoff performance in in 2015 district tournament and his astounding 48 strikeouts in 21 playoff innings in 2015 against the region’s two best teams. Committed to ECU. Playing for Stars Showcase Red 17U. At East Coast Pro 2015. At WWBA 2015 with Stars Marucci Prime. AllMetSports 2016 player to watch. Agnos picked right back up where he left off last spring, no-hitting a good Hylton team in the opener, striking out 17. Matt Mervis, RHP from Georgetown Prep. 2nd team All-Met 2015. Early commit to Duke. Playing for Chandler World. At PG National, at USA Baseball’s Tournament of Stars. At East Coast Pro 2015. At Prep 60 in Chicago. #1 ranked player in Maryland per Prep Baseball. Tyler Blohm, LHP from Spalding in Maryland. 2015 All-Met HM. Baltimore All-Metro 2015. Three-time MIAA all-state player as a junior. Early commit to Maryland. Evoshield Canes Main Roster for 2015. At PG National. AllMetSports 2016 player to watch. Jack Cunningham, RHP/OF for Paul VI (via South Riding). 2015 All-Met, runner up WCAC player of the year. VISAA Division I all-state in 2015. Playing for Stars Showcase Red 17U. At WWBA 2015 with Stars Marucci Prime. Committed to Boston College. AllMetSports 2016 player to watch. Anthony Felitti, LHP Gaithersburg HS. 10-0 with a 0.85 ERA as a junior, started and won 4-A title game. 2015 All-Met. Playing for Mid-Atlantic Red Sox. Early commit to UVA but has apparently signed with GMU. Prep Baseball’s #2 Maryland prep player. AllMetSports 2016 player to watch. John Callahan, SS from Stone Bridge. 2015 All-Met, 2015 All 5-A North region. All Virginia 5-A. GMU commit. Diamond Elite for 2015. AllMetSports 2016 player to watch. Carter Sears, C from Spalding. 2015 2nd-team all-Metro Baltimore. Committed to JMU per perfectgame.org. Matt Favero, LHP from Madison. 2nd team All-Met 2015. All 6-A North Region. 2nd team all-State 6-A. Playing for Stars Showcase Red/Blue 17U. At WWBA 2015 with Stars Marucci Prime. Committed to BYU. Pete Nielsen, SS from Madison. 2nd team All-Met 2015, 2nd team All 6-A North Region. At WWBA 2015 with Stars Marucci Prime. Committed to BYU. AllMetSports 2016 player to watch. Rafi Vazquez, RHP/OF from O’Connell. 2nd team All-Met 2015. VISAA Division I all-state in 2015. Early commit to Coastal Carolina. Evoshield regional team. WWBA 2015 with 17-U Evoshield. AllMetSports 2016 player to watch. Brett Norwood, DH from Chantilly. 2nd team All-Met 2015, All 6-A North region in 2015. Little known about Norwood, who doesn’t have a perfectgame.org profile. Eli Quiceno, C from Stone Bridge. Starter for Stone Bridge’s two straight 5-A championship teams. Playing for Diamond Elite. Committed to Gannon University in Pennsylvania. Nick Neville, SS from Lake Braddock IMG Academy in Florida (hails from Fairfax). Little local recognition but got written up at the 17u WWBA event thanks to his speed and power. Playing for Diamond Elite. Moved to Florida for his Sr. year to play for IMG and is now committed to Notre Dame (h/t Joe Antonellis). Elliott Zoellner, RHP from St. Marys (Annapolis). Little local recognition but got written up at the 17u WWBA event thanks to his speed and power. Playing for Evoshield North team. WWBA 2015 with 17-U Evoshield. Prep Baseball’s #3 ranked Maryland prep. Committed to UMaryland per perfectgame.org. Justin Ager, RHP for Loudoun Valley HS. Committed to Yale, playing for Chandler World at 17u WWBA event. Carter Bach, LHP/1B, OF for Centreville HS in Clifton, VA. At WWBA 2015 with Stars Marucci Prime. Committed to Wake Forest. Steve Johel, RHP from Marshall HS, Vienna VA. Committed to Coastal Carolina. Jared DiCesare from Chantilly HS, Playing for Oriole’s Scout team summer of 2015. Committed to GMU. 6-A North 2016 player of the year. Logan Driscoll from Lake Braddock, Playing for Stars Baseball-Prime summer of 2015. Also committed to GMU. Cam Remalia from St. Johns in DC (by way of Waldorf): Named 2016 Gatorade POTY for DC. Committed to Coastal Carolina. Fox Semones, RHP from Hylton, committed to JMU. Nice WP feature on him post Hylton’s 6-A South victory. Probably not a draft prospect but mentioned here. Brendon Doyle, OF from Kettle Run, committed to VMI. 2016 4A West Region player of the year. Alex Smith, C from Mountain View. Committed to Navy. 2015 5-A North region player of the year. Here’s a list of extended DC/MD/VA Prep players (outside DC Area) on the radar. Zack Hess, 1B/OF from Liberty Christian Academy (Lynchburg). VISAA Division I player of the year as a junior in 2015, early commit to Virginia Tech but now committed to LSU (thanks commenter joemktg). Playing for the Dirtbags (NC) summer of 2015. At PG National. Showed 93-95 at WWBA 17u tournament. At East Coast Pro 2015. At the Area Code games 2015. Will be at the 2016 National HS Invitational in March. D1baseball top 100 hs draft prospects. 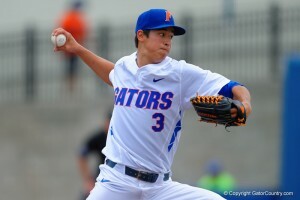 Nearly threw a no-hitter at the NHSI. Brenan Hanifee, RHP from Turner Ashby. ECU commit, little known about him until he became a 4th round pick in 2016. Garrett Stallings, RHP from Grassfield HS (Chesapeake). Evoshield Canes main roster, early commit to Tennessee. At PG National. At East Coast Pro 2015. Area Code games 2015. At WWBA 2015 with Evoshield, getting the Win in the championship game. All 6-A south region 2016. Michael Bienlien, RHP from Great Bridge (Chesapeake). Evoshield Canes main roster, early commit to South Carolina but now committed to NC State (thanks commenter joemktg). At PG National. At East Coast Pro 2015, at WWBA 2015. Noah Murdock, a big (6’7″) RHP from Colonial Heights (Richmond). All 3-A East Region 2015, early UVA commit. VA Cardinals for summer 2015. At East Coast Pro 2015. In Richmond Times/Dispatch’s 2016 pre-season watch list. Cayman Richardson, SS from Hanover in Mechanicsville (NE Richmond suburb). VA Cardinals for summer 2015, early UVA commit. At East Coast Pro 2015. In Richmond Times/Dispatch’s 2016 pre-season watch list. Vinnie Pasquantino, a 1B from James River HS (Richmond); VA Cardinals for summer 2015, written up during WWBA 17u tourney. Committed to ODU. At East Coast Pro 2015. In Richmond Times/Dispatch’s 2016 pre-season watch list. Robert “Bobby” Nicholson: P/Inf from St. Anne’s Belfield HS (Charlottesville), early commit to UVA. USA Baseball’s Tournament of Stars. Playing for Chandler World. Written up during 17u WWBA event. Justin Sorokowski, 3B/OF from Lee-Davis HS in Mechanicsville (NE Richmond suburb). VA Cardinals for summer 2015, early Florida State commit. In Richmond Times/Dispatch’s 2016 pre-season watch list. Derek Bjorlo, utility from Nandua HS (Onancock, on the Delmarva peninsula), Evoshield American for 2015, committed to Coastal Carolina. At WWBA 2015 with the main Evoshield team. Hayden Moore, RHP from Hanover HS, Evoshield regional roster for 2015, early commit to VCU. Jalen Harrison, OF from St. Anne’s Belfield HS (Charlottesville), early commit to UVA. Evoshield American for 2015. Forrest Smith, C from Maggie Walker (Richmond), early commit to William & Mary. Evoshield American for 2015. John Fitzgerald, 3B from Gilman (Baltimore). All-MIAA and all-Metro Baltimore 2015. No PG profile. William Strong, 1B from Patrick Henry (Ashland/Richmond). All 5-A North Region 2015. Playing for Evoshield Canes. Committed to Florence-Darlington Technical College per PG. Matthew Nickles, 3B from Colonial Forge (Stafford). All Virginia 6-A South in 2015; Committed to Randolph-Macon per Joe Antonellis. All 6-A south region 2016. Paul Movizzo, 1B/OF from Cox HS (Virginia Beach). 2nd-team all Virginia 6-A in 2015. Corey Klak, LHP from Western Branch HS (Chesapeake). VA Cardinals for summer 2015, written up during WWBA 17u tourney. Also committed to ODU. All 6-A south region 2016. Banks Northington, 1B/OF from Charlottesville HS, playing for Chandler World at WWBA 17u. Committed per PBR to Gettysburg college. Bryce Runey, C from Riverbend HS in Spotsylvania, VA. At WWBA 2015 with Evoshield. Committed to Mary Washington per PG. Harry Brown, C/1B, 3B from Greenbrier Christian Academy in Virginia Beach, VA. WWBA 2015 with Richmond Braves, committed to JMU. 2016 VISAA Division II player of the year. Andre Lipcius & Luc Lipcius: from Lafayette HS in Williamsburg, VA. Early commits to Tennessee, WWBA 2015 with Richmond Braves. Kyle Battle, Glen Allen OF, early commit to ODU. In Richmond Times/Dispatch’s 2016 pre-season watch list. Kent Klyman, LHP from Jamestown HS in Williamsburg. NC State commit. Lots of velocity, no PG presence. Andrew Webb, C Forest Park. 6-A south All-Region 2016. Christian Hague, 1B/RHP Cosby. 6-A south All-Region 2016. Coincidentally, PrepBaseballReport.com keeps a database of commitments at this link here for VA players; pulldowns by class and state. I suspect more than a few of these guys will get drafted and forgo college, but if not, here’s a quick look at the commits by college (with the caveat that lots of these are “very early” and probably change). I’ve got the college in rough order of their national significance. USAToday Pre-Season Prep all Americans 2016: nobody local but a huge number of names you’re going to hear in the 1st round in June. MLB.com’s 2016 “On the Clock” summer schedule for next year’s draft class. Perfect Game National Showcase player roster, Mid June 2015 Ft. Myers FL. USA Baseball Tournament of Stars roster, Mid June 2015 Cary NC. Perfect Game WWBA 17U championships, July 3-10, Emerson GA.
17U Perfect Game World Series, July 17-22 in AZ. East Coast Pro Showcase Rosters (End of July); Tampa, FL. Area Code Games, Aug 2015 Long Beach, CA. WWBA World Championships in Jupiter, FL end of October 2015; Evoshield rosters from this event. Stars Roster from this event, Richmond Braves roster from this event, Virginia Cardinals roster from this event. Super 60 Feb 2016 in Chicago. Evoshield Canes’ 2015 summer 17U roster, full of 2016 graduating class players from one of the best traveling teams in the nation, locally based. WP’s 2015 All-Met announcement, identifying all underclassmen. The Baltimore Sun’s 2015 All-Metro Baseball Team. All 2015 6-A North and 6-A South region teams, identifying underclassmen. VISAA’s 2015 All-State players, identifying key underclassmen. VHSL 2015 All-State Teams: for all 6 divisions. Lots of underclassmen noted. Baltimore Sun’s 2016 Players to Watch list. Richmond Times/Dispatch’s 2016 pre-season watch list. AllMetSports 2016 baseball preview (though by the time that published, all the guys they noted were already here).